Sauerkraut is a German word meaning "sour cabbage," and this fermented food has a long and rich history of use around the world for both preservation and medicinal purposes.1 The FDA's Food Inspection Decision 196 defines sauerkraut as "the product, of characteristic acid flavor, obtained by the full fermentation, chiefly lactic, of properly prepared and shredded cabbage in the presence of not less than 2% nor more than 3% of salt. It contains, upon completion of the fermentation, not less than 1.5% of acid, expressed as lactic acid. "2 Historically, claims of health benefits attributed to sauerkraut abound, but is there any evidence to back up these claims? Since the start of the 21st century, there has been a sort of fermentation revival sweeping the country as more research reveals the potential health benefits of fermented foods. Fermentation has been used since ancient times as a method of food preservation; the process enhances the nutritive value and flavors and reduces the toxicity of many foods.8 When making sauerkraut, the starter is the normal mixed biota of the cabbage. Adding salt inhibits the growth of gram-negative bacteria while favoring the lactic bacteria, which convert sugar into lactic acid. Fermentation will naturally stop when the maximum acidity has been reached.9 Alex Lewin, a fermentation advocate and author of two books on the subject, Real Food Fermentation: Preserving Whole Fresh Food With Live Cultures in Your Home Kitchen and Kombucha, Kefir, and Beyond: A Fun & Flavorful Guide to Fermenting Your Own Probiotic Beverages at Home, notes that sauerkraut can be stored safely at room temperature for weeks, months, or even years because it's so acidic; most harmful bacteria won't grow at a pH level below 4.6.10 Lewin says it's important to be sure that the cabbage stays submerged in the brine to prevent surface molds from forming. Research into the health benefits of fermented foods, including sauerkraut, is fairly new. One area of interest is fermented foods' potential probiotic properties. Some of the beneficial bacteria involved in the fermentation process may still be alive at the time of consumption in "raw" fermented foods that haven't been heat treated. Consuming these "good" bacteria may help improve the balance between beneficial and harmful bacteria in the gut.13 Consuming different strains of probiotic bacteria may have an even greater benefit, as different strains have different effects. One study found 28 different strains of lactic acid bacteria present in commercially prepared sauerkraut.14 These beneficial bacteria also produce enzymes that may make fermented foods easier to digest than unfermented foods.15 If clients want to ensure they're getting probiotics in their sauerkraut, they should choose refrigerated varieties instead of pasteurized sauerkrauts off the shelf. Varieties that say, "Contains live and active cultures" on the label also should contain probiotics. In Germany, sauerkraut often is served with bratwurst or alongside schupfnudel, a gnocchi-like potato dumpling. In Poland, bigos, a traditional stew, features meat cooked with vegetables and sauerkraut, and sauerkraut is one of the most popular fillings for Polish pierogi.18 Jota, a Slovenian soup, traditionally contains beans, potatoes, and sauerkraut. The French put their own spin on choucroute (the French word for sauerkraut) by adding potatoes, and it's often served with various meats and charcuterie. Visit New York and you might have a New York-style hot dog topped with spicy brown mustard and sauerkraut, or a Reuben sandwich filled with corned beef, Swiss cheese, sauerkraut, and Russian dressing. Today, proponents of sauerkraut as a health food are suggesting better-for-you applications. Nussinow says she eats sauerkraut on top of whole grains and vegetables, and Katz suggests an elegant appetizer made by wrapping fermented cabbage leaves into rolls filled with crumbled feta or goat cheese.18 Clients can use the recipe on this page to try their hand at homemade sauerkraut, and RDs can encourage healthful applications of this popular fermented food. — Jessica Ivey, RDN, LDN, is a dietitian and chef with a passion for teaching people to eat healthfully for a happy and delicious life. Ivey offers approachable healthful living tips, from fast recipes to meal prep guides and ways to enjoy exercise on her website, JessicaIveyRDN.com. 1. Farnworth ER, ed. Handbook of Fermented Functional Foods. 2nd ed. Boca Raton, FL: CRC Press; 2008:20-21. 2. CPG Sec. 585.750 sauerkraut — definition; adulteration by thrips. US Food and Drug Administration website. https://www.fda.gov/ICECI/ComplianceManuals/CompliancePolicyGuidanceManual/ucm074636.htm. Updated November 29, 2005. Accessed August 17, 2018. 3. O'Brien J, Climenhage RJ. Fresh & Fermented: 85 Delicious Ways to Make Fermented Carrots, Kraut, and Kimchi Part of Every Meal. Seattle, WA: Sasquatch Books; 2014:10. 4. Toussaint-Samat M. A History of Food. New York, NY: Barnes & Noble Books; 1998:693-694. 5. Pederson CS, Albury MN. Bulletin: Number 824: The Sauerkraut Fermentation. Geneva, NY: New York State Agricultural Experiment Station; 1969. 6. Hess AF. Scurvy, Past and Present. Philadelphia, PA: J. B. Lippincott Company; 1920:8-9. 7. Sauerkraut may be liberty cabbage. The New York Times. April 25, 1918. https://timesmachine.nytimes.com/timesmachine/1918/04/25/96864971.pdf. Accessed August 23, 2018. 8. Swain MR, Anandharaj M, Ray RC, Rani RP. Fermented fruits and vegetables of Asia: a potential source of probiotics. Biotechnol Res Int. 2014;2014:250424. 9. Jay JM, Loessner MJ, Golden DA. Modern Food Microbiology. 7th ed. New York, NY: Springer Science & Business Media; 2005:180. 10. US Food and Drug Administration. Science and our food supply: food safety A to Z reference guide. https://www.fda.gov/downloads/food/foodscienceresearch/toolsmaterials/ucm430363.pdf. Published 2014. Accessed August 23, 2018. 11. Katz S. Vegetable fermentation further simplified. Wild Fermentation website. https://www.wildfermentation.com/category/sauerkrautrecipes/. Updated April 27, 2012. Accessed August 23, 2018. 12. US Department of Agriculture, Agricultural Research Service. USDA food composition databases. https://ndb.nal.usda.gov/ndb/. Updated April 2018. Accessed August 23, 2018. 13. Fermented foods can add depth to your diet. Harvard Health Publishing website. 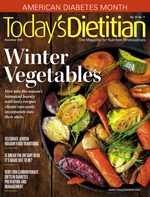 https://www.health.harvard.edu/staying-healthy/fermented-foods-can-add-depth-to-your-diet. Published July 2018. Accessed August 23, 2018. 14. Lu Z, Breidt F, Plengvidhya V, Fleming HP. Bacteriophage ecology in commercial sauerkraut fermentations. Appl Environ Microbiol. 2003;69(6):3192-3202. 15. Battcock M, Azam-Ali S; Food and Agriculture Organization of the United Nations Fermented Fruits and Vegetables: A Global Perspective. Rome, Italy: Food and Agriculture Organization of the United Nations; 1998. 16. Ren JS, Kamangar F, Forman D, Islami F. Pickled food and risk of gastric cancer — a systematic review and meta-analysis of English and Chinese literature. Cancer Epidemiol Biomarkers Prev. 2012;21(6):905-915. 17. Islami F, Ren JS, Taylor PR, Kamangar F. Pickled vegetables and the risk of oesophageal cancer: a meta-analysis. Br J Cancer. 2009;101(9):1641-1647. 18. Katz SE. Wild Fermentation: The Flavor, Nutrition, and Craft of Live-Culture Foods. 2nd ed. White River Junction, VT: Chelsea Green Publishing; 2016:81. 2. Add cabbage and salt to mixing bowl, and squeeze aggressively with hands until very juicy. 3. Stuff cabbage mixture tightly into jar with its liquid until liquid rises above top of cabbage. 4. Close jar. Label contents and date with tape and marker. 5. Leave jar at room temperature (55° to 85° F), preferably in plain sight. 6. Once a day for the first few days, open lid slowly just until gas escapes (if any), then close immediately. 7. After two weeks (or more or less depending on ambient temperature), eat, refrigerate, or leave on counter if more sourness is desired. 1. Use the best salt you can. Ideally, it should not be explicitly iodized, it should not contain "anticaking agents," and it should contain trace minerals. Sea salt and Himalayan salt are ideal. 2. Do not wash your hands, your utensils, or anything else with antibacterial soap.